Sinn Féin candidate for the Glens Oliver McMullan has called on the public to be vigilant in light of a spate of ATM robberies around the country. Oliver McMullan said: "There have been numerous ATM robberies in recent weeks across the country and particularly in the north. "This week an ATM robbery brought concern closer to home with the attack on an ATM just up the coast in Bushmills. "ATMs are a vital resource to the local community, businesses and visitors. "This is particularly so in the case of the Glens where which has seen the closure of local bank branches. "I would call on public to remain vigilant particularly in regard to the movement of heavy machinery at tight and to report anything suspicious to the PSNI." Sinn Féin MLA Cathal Boylan has condemned a pipe bomb attack on a house in the Windmill Avenue area of Armagh last night. “Two pipe bombs exploded at a house in Windmill Avenue while three people were in it. “These devices put residents’ lives at risk. “I’m relieved that no one has been hurt. Sinn Féin spokesperson for LGBTQI Rights Senator Fintan Warfield today is holding a briefing in Leinster House with Love Equality NI – the campaign for civil marriage equality in the North. The briefing is being held for politicians and staff from all parties and none to receive an update on the campaign and how they can support it as a TD or Senator. The briefing is co-sponsored by Senators David Norris and Jerry Buttimer. “I am delighted to invite Love Equality NI to the Oireachtas and look forward to the event. “Civil marriage equality is about protecting our families, neighbours, and friends. It is about two people making a commitment to share in the ups and downs of life. It is also about ensuring that the state recognises all of our relationships equally. “These are rights enjoyed by Irish and British citizens in all other jurisdictions. It is an injustice that we continue to see efforts toward equality being blocked in the north. Sinn Féin’s Joe Duffy has branded the burning of his election posters on Tuesday night ‘despicable’ and an attack on the democratic process. “I was contacted by a local resident tonight letting me know that my election posters had been set alight in the Cutts area. Sinn Féin MLA John O’Dowd has called on authorities to remove a banner from Portadown town centre which is designed to cause hurt to the victims of Bloody Sunday and cause community division. “The banner proclaiming support for a murder suspect is not appropriate. Sinn Féin Senator Niall Ó Donnghaile has said the true story of what happened in the Loughinisland massacre must be made public after hosting a briefing in Leinster House with journalists Trevor Birney and Barry McCaffrey involved in making the film ‘No Stone Unturned’. The film shone a light on collusion between the loyalist gang which murdered six men in the Heights Bar in Loughinisland, Co Down, in 1994 and British intelligence services. The two journalists are currently on bail after they were arrested by police who accused them of possessing confidential documents. “The Police Ombudsman found that there were serious failings in the investigation into those responsible for the Loughinisland massacre and found that there had been collusion. “The film ‘No Stone Unturned’ exposes the depth of collusion between the UVF killers of the six men in Loughinisland and the RUC and British intelligence agencies. “However, instead of the PSNI following up on the evidence laid out in this documentary they have attempted to silence the journalists who have tried to uncover the truth. “The arrests of Trevor Birney and Barry McCaffrey are an attack on free speech and are an insult to the Loughinisland Families who are still waiting, not only for justice, but a proper investigation into the murder of their loved ones. “An Taoiseach must ensure the Irish State will do all it can to help protect press freedom investigating such matters and families that are still seeking justice for their loved ones. “Sinn Féin will continue to support press freedom and families in their quest for justice. Sinn Féin Finance Spokesperson Pearse Doherty TD has called on the government to adopt more credible and realistic presentation of the public finances. The Donegal TD was speaking following the publication of the Stability Programme Update by the Department of Finance, which assesses the Irish economy and public finances in the time ahead. “Once again the government have published a Stability Programme Update that is based on unrealistic projections of the public finances which lack credibility. “Brexit-related forecasts depend on a rosy picture of the British economy in which growth and sterling maintain their current strength. "There is only €1.45bn of a spending increase projected for next year, but already €1.2bn of it pre-committed. This in no way provides for the investment our society sorely needs, and is simply a wildly unrealistic assumption. “What we do know from this SPU is that a modest general government surplus in 2020 provides a real opportunity to tackle the serious risks facing the Irish economy, at home and abroad. “Brexit threatens tens of thousands of jobs over the next decade, and will stunt our economic growth. Moreover, global economic growth is weakening. “Sinn Féin would take this opportunity to invest in public services that will lower the cost of living for families across the island. We must invest now in public infrastructure to prepare for the uncertain times ahead and to lower our carbon emissions. “Otherwise, it is public money that will be as vulnerable as the rest of the State’s finances to Fine Gael’s track record of flagrant waste and plunder to private interests. “Well over €1bn of public funds will be lost in the time ahead as the government allows it to leak into the coffers of private bidders for the National Children’s Hospital. “Today the Taoiseach confirmed that the excessive cost of the National Broadband Plan would be in the region of €3bn, all going to private coffers. “On top of this, Fine Gael fork out hundreds of millions a year of taxpayer's money in handouts to booming banks, landlords, super-rich property moguls and Vulture Funds leeching off families in financial distress. 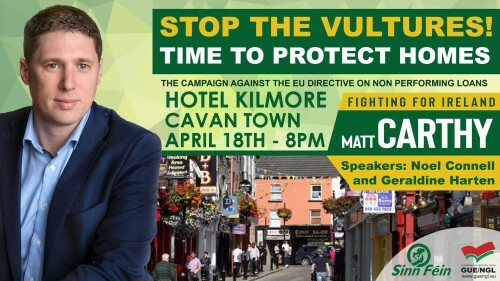 Sinn Féin MEP Matt Carthy will host a “Stop the Vultures! Time to Protect Homes” public meeting in the Hotel Kilmore in Cavan this Thursday the 18th of April at 8pm. The Midlands Northwest MEP has been central to the campaign against the EU directive on non-performing loans which he says will strengthen the free rein giving to the banks and vulture funds and will force more families out of their homes. Ahead of the event in Cavan town Carthy spoke of the government’s lack of action on Ireland’s housing crisis. “Sinn Féin is standing with communities and campaigning for policies that will benefit the Irish people and not the banks and vultures at the local, state and EU level. Local Sinn Féin representatives Noel Connell and Geraldine Harten will also address the meeting. “Leo Varadkar has stated that the cost of broadband rollout will now be many multiples of the original estimate. “His government’s mismanagement of provision of a vital infrastructure for rural Ireland, once again exposes Fine Gael’s utter disregard for people living in rural areas. “The government needs to explain to half a million households across the state why they are still without broadband and when they will get it. “Taxpayers also need to be given clarity on the final cost of this project. They also need to be told what the government’s Plan B is, in the event of it abandoning the current process. Sinn Fein Senator Paul Gavan has called on the Government to take immediate steps towards implementing a Labour Court Recommendation to provide pensions for Community Employment (CE) scheme supervisors. The recommendation, which would apply to 1250 workers, has been outstanding for 11 years. Senator Gavan joined over 200 SIPTU members for a lunchtime protest over the issue today outside of the Oireachtas. “These CE workers have been treated with contempt by successive governments since 2008. Their union SIPTU has been tireless in pursuing this issue throughout this time. "In the 2015 Landsdowne Road Agreement, SIPTU secured the setting up a High Level Forum to deal with the issue of pensions for CE Supervisors once and for all. "However since then the Government has refused to engage properly with the Forum. “Perhaps the most disgraceful aspect of this issue is the outright refusal to date of the Government to engage in any way with SIPTU. "The union has written to the Minister for Finance Paschal Donohue requesting a meeting on the issue but have yet to receive even an acknowledgement of this request. “I am calling on Minister Donohue to show respect to these 1250 workers and also to show respect for the Industrial Relations Court of this State. “Minister Donohue should immediately agree to meet with SIPTU and engage constructively to deal with this issue. "What message does this Government send to rogue employers when it refuses for 11 years to implement a recommendation from the Labour Court? Invest NI, Belfast City Council and the Departments for the Economy and Communities must explain why official discussions were facilitated with a major DUP donor linked to so called Brexit ‘Dark Money’, Sinn Féin MLA Máirtín Ó Muilleoir has said.The party’s Brexit spokesperson was commenting after it was revealed that Richard Cook, a former vice chairman of the Scottish Conservatives, was involved in a series of senior meetings to discuss ‘potential investment opportunities’ in the months following the EU referendum. Mr. Cook chairs the shadowy Constitutional Research Council (CRC) that donated almost £450,000 in ‘Dark Money’ to the DUP to help fund the pro-Brexit campaign.“Unanswered questions remain about the source of those funds and why they were funnelled through the DUP,” Máirtín Ó Muilleoir said.“All we know for sure is that the DUP took the money but we are all paying the price in terms of the disastrous Brexit agenda they are attempting to force upon us.“Now it has emerged that Mr. Cook was involved in a series of official meetings with two DUP-controlled ministries, the Department for the Economy and the Department for Communities. He was also in discussions with Invest NI and Belfast City Council officials.“Given the secrecy and controversy surrounding Mr. Cook, the CRC and its role in the Brexit campaign, I think it’s understandable that questions are now being asked about these meetings. “I have written to the Head of the Civil Service, Invest NI and the council to ask what exactly was discussed at these meetings, who requested them and on what basis were they agreed to. "Today we submitted our party’s response to the consultation on Child Sexual Exploitation, which is designed to ensure that the law is kept up to date and modern to ensure the protection of children against sexual exploitation. Sinn Féin President Mary Lou McDonald TD has criticised the Government’s management of the National Broadband Plan, branding the process “farcical”. “The Taoiseach said that the cost of the rollout of the National Broadband Plan will be many multiples of what was originally estimated. “As with the scandalous cost overrun of the National Children’s Hospital, an absolutely vital piece of infrastructure that is desperately needed in much of rural Ireland, this project has gone way over budget and has been left at the mercy of a contractor. “There is now just one bidder remaining for the contract. This leaves the government, and the taxpayer in turn, in an extremely precarious position. “The entire process has been chaotic and quite frankly farcical. “Over half a million homes are still without access to broadband and they want answers. When will these homes get the access they need? When will we be given clarity on the final cost of the project? “We also need answers on the tendering process; if this process fails, or if the government decide to ditch it, what is Plan B? Sinn Féin Deputy Leader Michelle O’Neill has welcomed comments from US Speaker of the House Nancy Pelosi in which she ruled out any post-Brexit trade deal with Britain if it weakens the Good Friday Agreement. The Sinn Féin Vice President, who will meet with US delegation led by Pelosi in Dublin on Thursday, said the comments were a welcome reminder that there can be no dilution of the Good Friday Agreement as a result of Brexit. Michelle O’Neill said: “Nancy Pelosi’s comments are welcome and reinforce the US commitment to our peace agreements. “Brexit undermines our hard won agreements and the right and prosperity of citizens while also risking devastating damage to our economy. “The people of the north rejected Brexit, but it is being forced upon us against our will by the Tories and their partners in the DUP. “There is no good Brexit for Ireland but the Withdrawal Agreement and the Backstop are the bottom line in terms of safeguarding Irish interests. It is the least worst option and must be implemented. Sinn Féin spokesperson for Communications Brian Stanley TD has said the government must brief the Dáil and opposition spokespersons on the current state of the National Broadband Plan this week. “The Taoiseach promised that the government would brief the Dáil and opposition spokespersons on what is happening with the plan. To date I have received no briefing and this must happen before Easter. “The 540,000 homes and business that are waiting for this plan to be rolled out deserve to know what is happening. “This is one of the largest contracts the state has ever been involved in and true to the form of this government, there are concerns the project is amounting to an overspend similar to or more than the National Children’s Hospital. “Yet again this government has been shown to be incapable of delivering major capital projects. “We have highlighted the problems we see with the tendering process. We only have one bidder left which means it cannot be a competitive tender. Sinn Féin MLA Raymond McCartney has said comments made by a former British army officer over the decision to prosecute an ex-soldier for the murder of a Derry schoolboy in 1972 have added to the hurt of the families. "The family of 15 year-old Daniel Hegarty who was shot dead by a British soldier in Derry in 1972 received the news yesterday that a former soldier is to face charges for his murder following their long campaign for truth and justice. "Their dignified campaign stands in stark contrast to the comments from former British Army officer Richard Kemp who has only added to the distress and hurt of the family. "His comments were also indicative of the attitude of the British state towards dealing with the legacy of the conflict and the role of its forces, agents and their proxies in loyalist death squads. "The British government needs to end its blocking of access to the truth for victims of state violence and accept that no one can be above the law. "Mechanisms have been agreed to address the legacy of the conflict and we need to see this implemented." Sinn Féin spokesperson for Employment Affairs & Social Protection John Brady TD has said that only Government intervention can avert five consecutive days of strike action by Community Employment (CE) Supervisors and Assistant Supervisors. “The Government has a choice to make here. One option is to sit down with the trade unions, SIPTU and Fórsa who represent the 1,250 CE Supervisors and Assistant Supervisors concerned and discuss their pension claim. "Or alternatively they can sit back, continue to ignore a Labour Court recommendation and as a result, see community services fall apart in less than four weeks’ time. “If the five day strike is not averted before May 13th, the Government will be responsible for the shutdown of vital services such as meals on wheels, after-school clubs, and crèches right across the State. "There will also be a loss to organisations such as the Alzheimer’s Society of Ireland and the Irish Wheelchair Association. “It is now eleven years since the Labour Court ruled on the entitlement of pension provision for CE Supervisors and Assistant Supervisors. They waited patiently throughout the economic crash and they now want what they are rightfully entitled to, as determined by the Labour Court. “The Government cannot pick and choose the Labour Court recommendations that they implement. Nor can they direct workers to engage with the industrial machinery of the State while at the same time ignore its findings. Sinn Féin MLA Philip McGuigan has condemned those responsible for the overnight robbery of an ATM at a business in Bushmills. “I condemn this robbery which saw a digger being used to steal the ATM, causing substantial damage to the building and brought major disruption to Bushmills. "This is the second such robbery in North Antrim in as many weeks and people are beginning to ask how this gang can carry out these robberies unhindered. I have raised these raids at the Policing Board on two occasions and have been told that a special taskforce has been set up and that progress is being made but yet the robberies are continuing. "For many years it has been a struggle to get ATM machines into small towns and villages to provide a vital service for the community. These raids are putting that service at risk. “The PSNI need to catch those responsible to bring these incidents to an end." Dublin Sinn Féin MEP and Climate Change spokesperson Lynn Boylan is in Strasbourg this week for discussions at the Environment Committee with Greta Thunberg, a 16 year-old Swedish climate activist, who was blocked from addressing a full plenary of the Parliament by Fianna Fáil and Fine Gael’s groups in the EU. Tomorrow, Lynn will also launch a major Climate Emergency Manifesto which she has produced calling for Climate Change to be the number one priority for the next mandate of the European Parliament. “The next twelve years will be instrumental in determining the future of our planet and Ireland and the EU need to significantly step up their climate change commitments. “For the last decade, the EU and Ireland’s approach to climate change has failed by allowing big polluters a cheap way out. Market solutions haven’t worked. Carbon taxes don’t work. “It’s time we stopped big oil and gas companies having free reign in the European Parliament and ended their influence on Climate Change policy. Speaking this morning, Sinn Féin Health spokesperson Louise O’Reilly TD has said the inability of the government to address the crisis in children’s and youth mental health services show they are not fit to run the health service. The Fingal TD also called for increased and targeted investment to address the staffing crisis and ease soaring waiting lists. “Child and Adolescent Mental Health Services (CAMHS) have been in a state of crisis for some time now, we have witnessed this in the closure of beds at the children’s mental health unit in Linn Dara last year and, more recently this week, we have seen reports that children in Wexford are being accommodated in adult psychiatric units. “Despite commitments to improve mental health services by this government, the situation for children and young people has regressed; waiting lists for services have increased, early intervention is non-existent in areas, there is a lack of beds and capacity across the State, and youth mental health services are crippled by staffing shortages. “Figures released to me by the HSE show that the staffing deficit in CAMHS teams is so severe that the services need at least €40m investment just to address crippling staff shortages. “Despite significant population growth over the past decade, CAMHS teams are operating with barely half the staff they need (56%) under a ‘Vision for Change’. “To put this into context, there is a shortfall of 513 clinical posts in CAMHS and more than two in five posts are unfilled, including in psychiatry and psychology, nurse specialists in mental health, social worker posts, and therapy posts. “This means thousands of children and young people are not receiving the mental health supports they need within the appropriate timeframes. “This situation is the result of severe mismanagement of both mental health services and the health service by Fine Gael and it will take a huge effort to reverse the damage which they have done through policy failures.